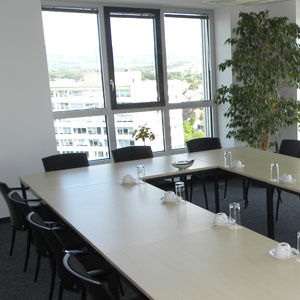 At the Conference Center in the Azenio Business Center in Eschborn, there is a conference room, a meeting room, a workshop or seminar room available. The meeting room has a seating capacity for up to fourteen participants. This conference room is ideal for small meetings and conferences. The Conference Center is located in an excellent and popular business area with a beautiful view of the Frankfurt skyline and the Taunus mountains. It is situated in one of the newest and most modern buildings in Eschborn. For your meeting, your conference, training, event or seminar, representative conference rooms are at your disposal. All ecologically air-conditioned rooms are equipped with day light, modern indirect lights and ergonomic furniture for your well-being. The Conference Center is equipped with a high-end IT-Network leaving nothing to be desired such as a telephone hand set with an integrated audio-conference system for up to six participants, two telephone lines per meeting room and wireless LAN internet access. On demand you can make use of our copying and fax machine or the LCD-Projector. At the Azenio Business Center in Eschborn our reliable and motivated secretaries undertake simple and challenging tasks. A multilingual, professional, reliable, competent and diligent secretarial team in the conference center is waiting for you.